Anti-evolutionist gangs have ratcheted up their campaign against the contoversial theory of evolution, turning to traditionalist graffiti to make their case. Their target: anything that claims to be more than 6,000 years old. MARIETTA, GA—It is the traditionalist equivalent of graffiti, stickers that appear under cover of darkness, targeting anything that promotes the theory of evolution, from text books to museum exhibits. 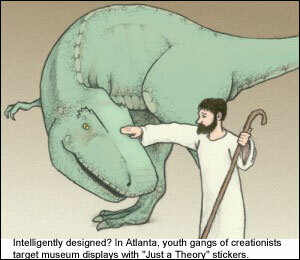 Opponents of the so-called "sticker wars" say that creationists have taken their adhesive campaign too far. Proponents say that they'll continue the cause until evolutionists embrace a controversial sticking point: the idea that the Earth is a mere 6,000 years old. In recent weeks, the "Just a Theory" stickers have been spotted at dozens of venues in suburban Cobb County: on fliers promoting a talk on planetary geology at a local community college, on science books at a Books-a-Million outlet and at a little girl's birthday party at which the guest of honor was a purple dinosaur named Barney. And while local residents have gotten used to living in a war zone of ideas ever since Cobb County school board members began placing stickers urging students to "critically consider evolution" on the covers of high school biology text books, some say that the sticker skirmishes have gone too far. Just ask Anita Snell, who rented an eight-foot-tall inflatable Barney doll to entertain her daughter Britney and 12 of her guests at Britney’s sixth birthday party last month. When the party was over and Snell began escorting her young guests out the front door, she noticed that something wasn’t right about Barney. "Barney was covered with these stickers that said 'Just a Theory.' Just a theory of what? Of how to ruin a little girl's birthday party?" asks Snell. She says that Britney has recovered from the shock of seeing the disfigured doll—and that the party store from which she rented the inflatable Barney took it back, stickers and all. But Snell remains angry nonetheless. "How am I supposed to explain this to Britney?" Some people may question what a dispute about the appropriate curricula for high school biology students has to do with everyone’s favorite purple dinosaur. But supporters of the sticker warriors have an easy answer: everything. Before 2002, students at Cobb County high schools were presented with only one explanation of the evolution of the origin of life. Thanks to the efforts of parents like Marjorie Rogers, who opposes the theory of evolution because it is "atheistic," students are now encouraged to take into account other theories of how we all got here, including the biblical story of creation. But there's a problem. According to the creationist view, the Earth is only 6,000 years old, meaning that anything that predates those dramatic six days when the Lord created the heavens and the Earth, is open to questioning and could merit a "just a theory" sticker. Paleontologists, for example, say that Barney's ancestors could date as far back as 120 million years. That's bunk, says Dr. Richard Paley, who teaches theobiology at Fellowship University. Dinosaurs, he writes, "did not live 65 million years ago, as evolutionists claim, since nothing but God existed then. They were created on the sixth day along with the other land animals (plesiosaurs, pterosaurs and others of their kinds are not strictly speaking dinosaurs, and they were created on the fifth day with the other animals of the water and sky.)" A US district court recently ruled that Cobb County cannot use the evolution disclaimer stickers on science texts, a decision that local residents say has further angered the anti-evolution gangs, who are now targeting any subject matter that claims to be more than 6,000 years old. Employees at the Cobb County Children’s Museum arrived at work last week to find that their Dinosaur Dig, an interactive exhibit that allows kids to uncover the dinosaur bones of a Tyrannosaurus Rex from a "tar pit," was the latest target. "The 'Just a Theory' stickers were everywhere," says museum docent Millicent Rogers. "They were all over the shovels, even on the little dinosaur bones. It took us forever to get them off." Museum staff members are now updating the exhibit in response to the incident, adding footprints next to the dinosaur bones to show that man and beast once lived side by side.